Detroit will host the 2014 NASFiC, Kevin Standlee is reporting. Detroit edged Phoenix 231-210. The official announcement will be made at the Sunday Business Meeting, and the winner will name its guests. Nearly all of the proposals to change the Hugos having been shot down yesterday at LoneStarCon 3’s Preliminary Business Meeting, only one was considered at Saturday’s Main Business Meeting. The intent seems to be adding to the black-letter rules something voters were already doing, considering the creators of work displayed in convention art shows. What “non-professional” means in this context is not clearly stated. Is that “Not For Sale” art, or is art offered for purchase okay too? Is the focus then on the artist — anything displayed in an art show is okay so long as the creator doesn’t work for a living as an artist? I expect that Hugo voters will be left to make up their own minds about this, as they are in so many other areas. Two controversial motions governing World Science Fiction Society voting rights and the minimum cost of supporting memberships, 4.1.2, No Representation Without Taxation and 4.1.3, Keep Us Together, which had prompted Seanan McGuire and others to call for opponents to turn out at the Business Meeting, ended up being referred to a committee which will make recommendations at Loncon 3 in 2014. Rachael Acks liveblogged the meeting and attempted to capture some of the arguments made on both sides, here. The outcome of all the items on Saturday’s agenda is reported by Kevin Standlee here. — New York District Court Judge Learned Hand to Supreme Court Justice Oliver Wendell Holmes, circa 1919. We all have opinions on the viability of a YA or Youth Book Hugo Award but we will never settle such an argument convincingly without actually testing it. It is my belief that such a test, of two of three years, would not harm the integrity of the Hugo Awards, would be welcomed by the readers who nominate and vote on the Hugos and the YA community at large. Change, through either growth or attrition, is the natural order of things. The pursuit of change is the primary drive of the fiction we all love. Indifference or denial of change can only lead to the death of fandom as we know it. I encourage journeyman activists who want to foster continued change in Hugo Award categories and the WSFS constitution to press on with their efforts. I also want to personally thank Donald Eastlake and Kevin Standlee for going out of their way to form a committee on this issue. I hope that this can be resolved in a more civil and courteous manner from this point forward. In the meantime, I call on the Loncon committee and the winners of the 2015 Worldcon bid to strongly consider using their constitutional Special Award clauses for a YA Book award. This winners of this year’s Sidewise Awards for Alternate History were announced at LoneStarCon 3 on August 31. The winners of the 2013 Chesley Awards given by the Association of Science Fiction and Fantasy Artists were announced at LoneStarCon 3 on August 30. James Bacon announced a Dublin bid for the 2019 Worldcon this afternoon at LoneStarCon 3. 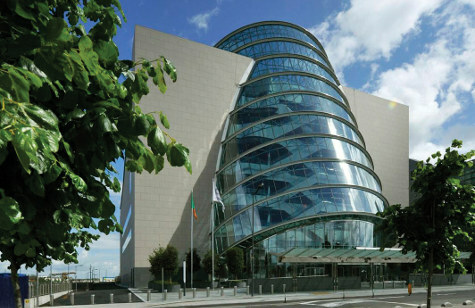 Their proposed venue is Convention Centre Dublin (CCD), on the north side of the River Liffey, a mile east of the center of the city. The CCD has a 2,000-seat auditorium with a full theatrical stage, six foyers and 4,500 square meters of exhibition space. The Worldcon would have sole use of the CCD. The con would be held August 14-19, 2019. The bid also has unveiled its official website. There is a wealth of detail about the facility, and hotels — 1,268 rooms are available within 850 meters or half a mile of the convention center. The Dublin bid will officially launch in August 2014 at the 72nd Worldcon in London, followed by a launch at Shamrokon (Dublin). Prior to that, Irish fans will attend Eastercon 2014 and Arisia in Boston. Fáilte Ireland, the National Tourism Development Authority, and The Dublin Convention Bureau have agreed to provide support for a Worldcon in Ireland, including monetary assistance, if the bid is successful. A downloadable copy of the bid brochure is here [PDF file]. With little more than 24 hours remaining to vote for the site of the 2015 Worldcon Brandon Sanderson’s endorsement of Spokane may not have a great impact on the race but I’m sure the bidders are happy to have it just the same. Since I was just hosted by these people, I think I’m in a unique position to give them—and their Worldcon bid—a shout-out. The guest liaison team was top-notch, and the entire convention was extremely well organized. I was surprised by how pretty Spokane was this time of year to boot. The LoneStarCon 3 daily newzine is available here. At this writing, five issues have been posted. 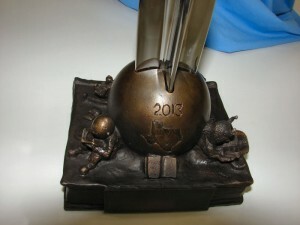 2013 Hugo Award base designed by Victor Villafranca. Photo: Kevin Standlee. Permission for non-commercial and journalistic uses with attribution granted. Close-up of 2013 Hugo base. Photo: Kevin Standlee. Permission for non-commercial and journalistic uses with attribution granted. Victor Villafranca’s 2013 Hugo Award trophy was displayed for the first time at LoneStarCon 3’s Opening Ceremonies on August 29. Thanks to Kevin Standlee for making his photos freely available at TheHugoAwards.org. 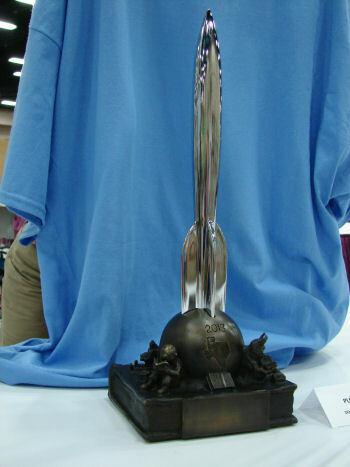 The culmination of Worldcon is the formal Hugo Awards ceremony, in which rocket-shaped trophies named for Hugo Gernsback, editor of the first pulp magazine, are bestowed on outstanding science fiction and fantasy work from the past year. Sixteen categories spanning fiction, film, art, and fan work, plus the unaffiliated John W. Campbell Award for best new writer, make this something like the Academy Awards of sci-fi, with most fans listening for the announcement of Best Novel at the end of the night. And like the Oscars, they have plenty of detractors. Every year the release of the shortlist raises cries of sinister cronyism and downright irrelevance, with fans taking to their blogs to lambast the ludicrous process of whittling down the vast and increasingly varied body of science fiction to just five nominees in each category.